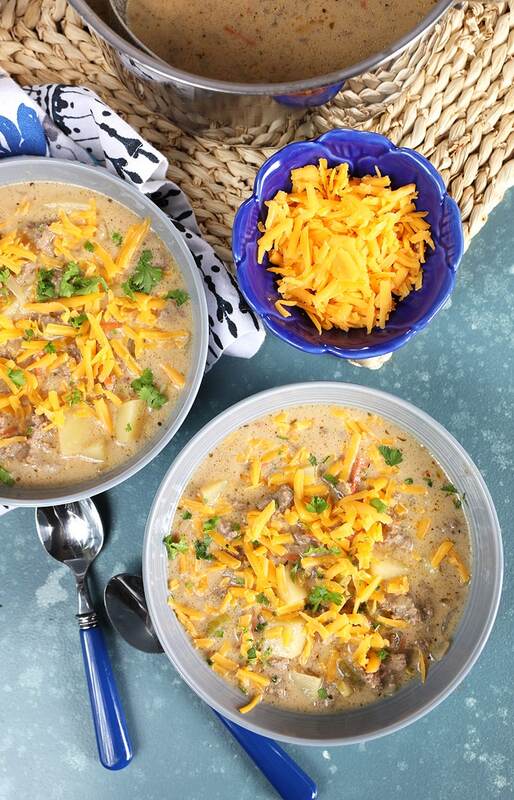 Quick and hearty, this Easy Cheeseburger Soup is on the table in less than 30 minutes. Loaded with all the favorite flavors of the best cheeseburger, this classic meal is a hit with the whole family. There’s a chill in the air here in the northeast and it’s making me crave all the comfort foods. 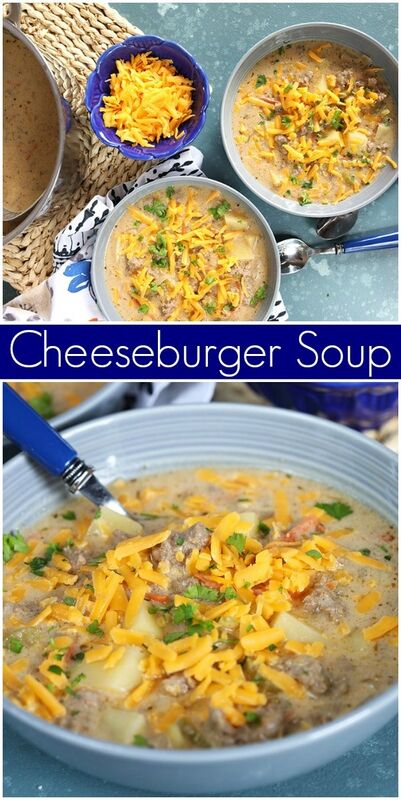 From stews to soups, I’m cooking up all my favorites right now with this easy Cheeseburger Soup on constant repeat. My kids love this one, so it makes sense that I would add it to the menu on a weekly basis. It’s on the table in about 30 minutes with just one pot to clean. If you’ve never had Cheeseburger Soup you’re in for a real treat. This soup is hearty and comforting. It’s filled with tender ground beef, tomatoes, cheese, onion and savory cheeseburger flavor. It’s so easy to make with ingredients you can keep in your kitchen all the time. 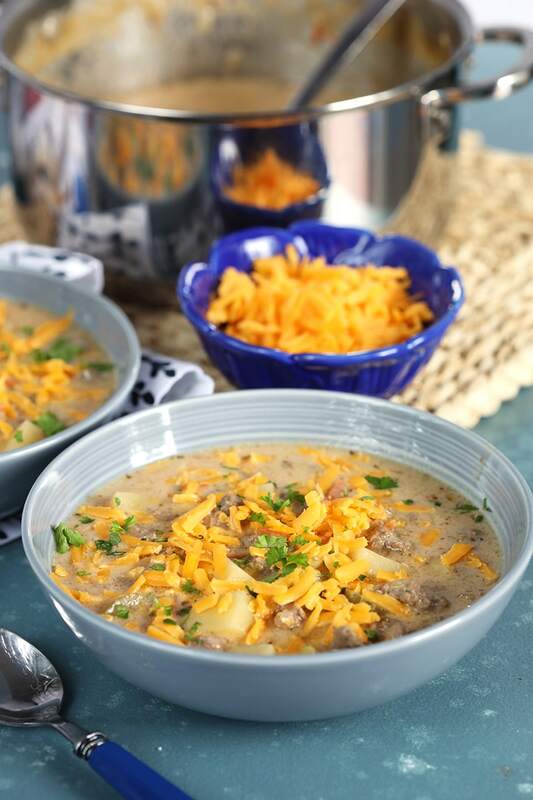 To make this Easy Cheeseburger Soup, you start with lean ground beef. Cook the beef in your soup pot until browned and no longer pink. Then remove the beef to a bowl. Add the onions, celery, carrot and garlic and cook until softened. Whisk in the cornstarch and potatoes, stirring to combine. Add the remaining ingredients and bring to a boil. Cook until the potatoes are softened, and then stir in the cheese. Stir in MORE cheese if you’re feeling adventurous. 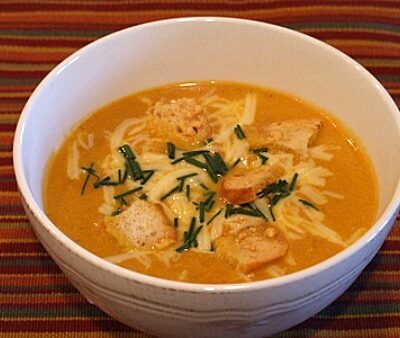 Or add a sprinkle of cheese to each serving of soup as a garnish. 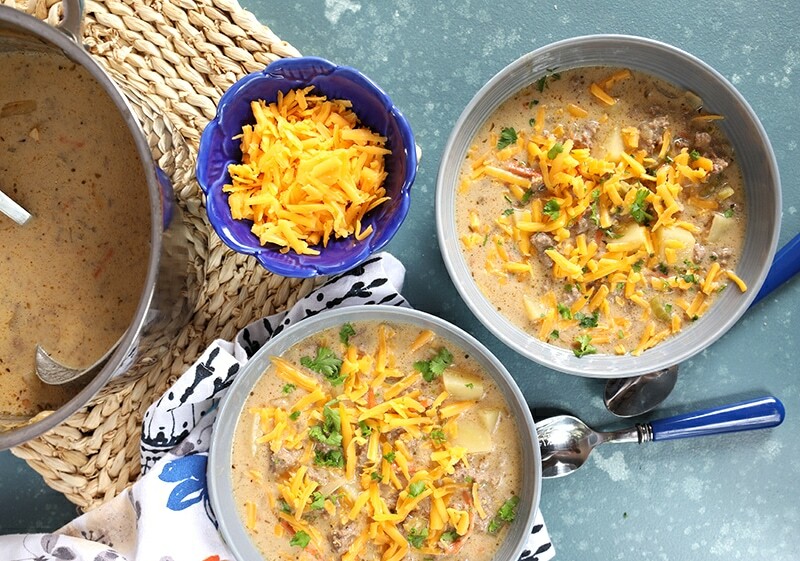 What do you serve with Cheeseburger Soup? 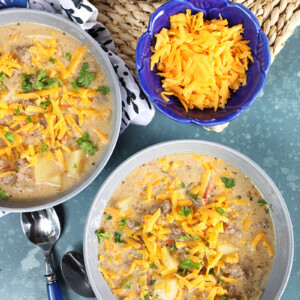 I like to serve this Easy Cheeseburger Soup with a variety of toppings so everyone can add what they want at the table. We love to top ours with crispy bacon, green onions, Swiss cheese shavings, diced tomatoes and pickles. There are really no rules! 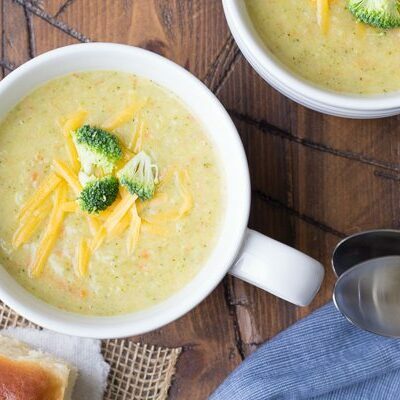 Whatever you top your burger with– you can top your soup with! 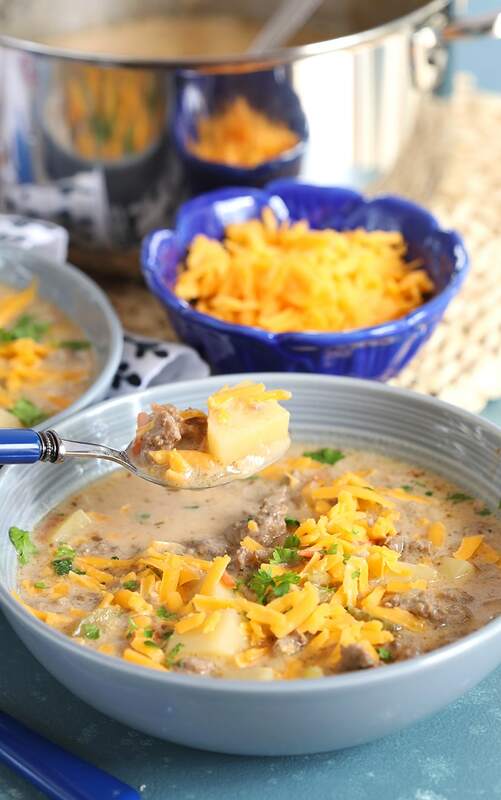 Even though this Cheeseburger Soup is hearty all on its own, I like to serve it alongside a light green salad or some easy oven fries. It kind of rounds out the meal a bit, and it stretches the soup out to feed more people if you have have people who stop in for dinner unexpectedly. 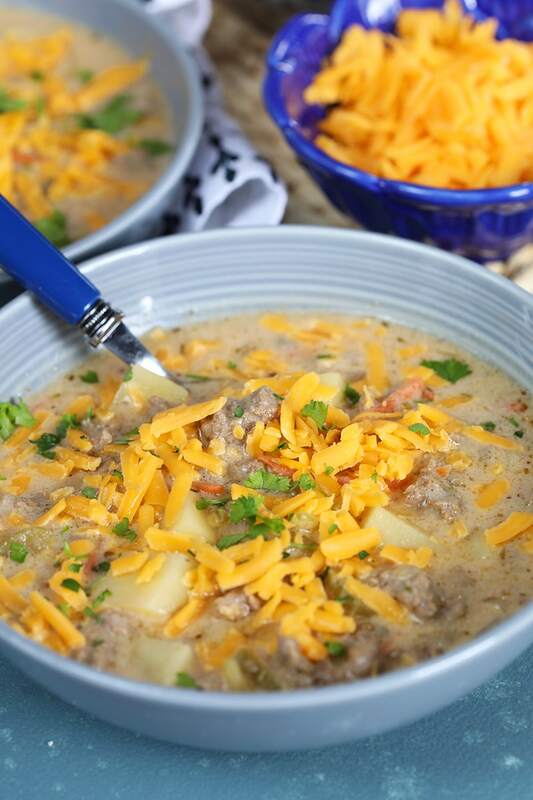 Ready in 30 minutes, this easy Cheeseburger Soup recipe is a great family weekday dinner. Add the ground beef to pot and break up into small pieces with a fork. Cook the beef until browned and no longer pink, approximately 7 to 10 minutes. Using a slotted spoon, transfer the beef to a bowl and set aside. Drain off all but 2 tablespoons of fat and return the pot to the heat. Add the onion, celery and carrots to the pot. Cook until softened, stirring occasionally, approximately 3 to 4 minutes. Stir in the garlic and cook for 1 additional minute. Sprinkle the cornstarch over the onion mixture and stir to combine. Stir in the tomatoes, Worcestershire sauce, Italian seasoning and mustard. Simmer for 5 minutes. Add the half and half and 1 cup of cheese to the soup stirring until the cheese is melted. 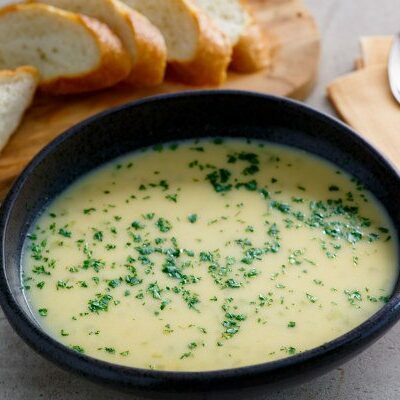 Serve bowls of soup topped with additional cheese and parsley. More suggested garnishes/toppings: crispy bacon, green onions, Swiss cheese shavings, diced tomatoes and pickles. If you’re preparing this soup as gluten-free, just be sure to use brands of beef broth and Worcestershire sauce that are known to be GF.